Shan Kishi provide fresh, high quality food only, Make sure to give the best environment and taste to each of our loyal customer. Eel, cucumber, and krab inside, topped w/peper tuna, avocado and eel sauce. Krab stick, scallion, cream cheese, wrapped in seaweed paper and then deep fried , topped with eel and avocado. Eel, avocado and crunchy flakes inside, topped w/ smoked salmon, eel sauce and wasabi sauce. Smoked salmon, eel, krab, tobiko, crunchy flakes and wrapped in soy paper, topped w/ eel sauce. Red snapper tempura, cucumber and apple inside, topped w/ tuna, mango and eel sauce. Snow crab, krab and spicy mayo inside, topped w/ avocado and black tobiko. Shrimp tempura, cream cheese and apple inside, topped w/ lobster salad and eel sauce. King crab, cream cheese and scallion inside, topped w/ tomago, crunchy flakes and eel sauce. King crab, snow crab and krab wrapped w/ soy paper, then deep fried. Mixed spicy fried fish and fried onion inside, topped w/ krab and eel sauce. Spicy tuna, spicy salmon, spicy yellowtail inside, topped w/ Spicy tuna, spicy salmon, spicy yellowtail. Spicy white tuna, tobiko and scallions inside, topped w/ tuna, salmon, Yellowtail, shrimps and avocado. Spicy tuna and crunchy flakes inside, topped w/ krab, tobiko and crunchy flakes. White tuna and avocado inside, topped w/ yellowtail, jalapeno and salmon roe. With ponzu sauce on the side. Shredded crab, avocado inside, topped w/ spicy tuna and white cream. Spicy shrimp, spicy craw fish, cream cheese inside, topped w/ shredded crab, eel sauce spicy mayo and white sauce. Tuna and avocado inside, topped w/ tuna and spicy mayo. Shrimp tempura, cream cheese and cucumber inside, topped w/ pepper tuna, black caviar, eel sauce and wasabi sauce. Tempura soft shell crab, lettuce and cream cheese inside, topped w/ shredded Crab, caviar and Cajun sauce. Spicy tuna, spicy white tuna, crunchy flakes, tobiko, apple and wrapped in soy paper. Shredded crab, avocado inside, topped w/ salmon, sweet hot jalapeno pepper. Garlic pepper chicken inside, topped w/ shredded crab and spicy Cajun sauce. Chopped steak and cucumber inside, topped w/ eel avocado and eel sauce. Deep fried roll w/ spicy craw fish and cream cheese inside, topped w/ spicy krab salad and caviar. Steamed shrimp, krab, lettuce, cucumber and wasabi inside, topped w/ salmon, tuna, white tuna, green tobiko and wasabi sauce. Spicy salmon, spicy krab, cucumber, scallion and tobiko inside, topped w/ salmon and avocado. Spicy white fish and spicy krab inside, topped w/ salmon, avocado, mango, jalapeno, green and red tobiko. Spicy krab, avocado and crunchy flakes inside, topped w/ spicy red snapper. 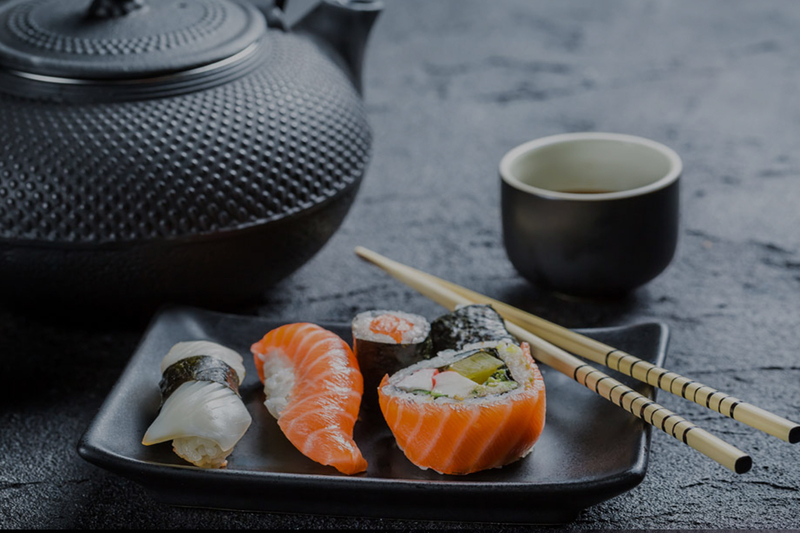 Served w. Miso Soup & Green Salad Shan Kishi provide fresh, high quality food only, Make sure to give the best environment and taste to each of our loyal customer. All entrees served with soup, salad and rice. Crème Brûlée Creamy custard topped with caramelized suger, presented in a glass cup.